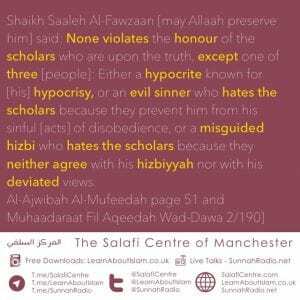 None violates the honour of the scholars who are upon the truth, except one of three [people]: Either a hypocrite known for [his] hypocrisy, or an evil sinner who hates the scholars because they prevent him from his sinful [acts] of disobedience, or a misguided hizbi who hates the scholars because they neither agree with his hizbiyyah nor with his deviated views. Which Solution does Ridiculous Naveed Ayaaz [Madeenah Dot Con/Islaam Nelson] desire for Us?! Indeed Ahlus Sunnah are people who possess fear of Allaah. They neither make Takfeer, Tafseeq (i.e. declare a person a sinner) and Tabdee (declare a person an innovator) except against the one who deserves it based on the evidences in the Book and the Sunnah, and the understanding of the pious predecessors of this Ummah. The people of desires and misguidance are (categorized into) those who are followed and those who follow; Indeed, those who are followed are the ones who set up the various principles of innovation and they call to their innovation and misguidance, and they will carry their burden of sins and the burden of the sins of those whom they misguided without knowledge, as it is clearly stated in the Qur’aan and the Sunnah. Those who possess knowledge, but they harbour evil intentions; so they yield to Satan, desires and the urge of the evil soul. They follow the people of misguidance and oppose the callers to guidance (in that which) Allaah sent His Messenger Muhammad (sallal-laahu-alayhi-wasallam) with. Their share of knowledge is little, so the people of desires take advantage of them and they become (part) of their group. They convince them that what they call them to is the manifest truth and that what their opponents are upon is falsehood. And they convey to them a huge (number) of shubuhaat, in order to deceive them and submerge them into misguidance. As for those who are followed—those who set up the principles of bidah and call the people to their bidah and misguidance–then indeed they are attributed to the bidah they innovated and call the people to, and for them there is no honour. As for the followers of the people of desires, it is as I have stated that they are of two categories in most cases. They are to be called to the Sunnah and to cling to it, and that they (should) reject the bidah they have been deceived by and have yielded to. And if they respond to the call of truth through knowledge and action, and reject that which the people of desires and innovation call them to, then this is what is desired and it is a praiseworthy aim. If they reject the advice of the advisers and bargain with falsehood at the expense of truth, and give preference to innovation over the Sunnah, then they deserve to be assigned the term innovator. So we say to ridiculous Naveed: This is the solution! It is what we have established based on the verdicts of the scholars against the three figure heads of Bidah and Dalaalah [Halabi, Maghraawi, Maribi], and their staunch follower Abu Usaamah. As for those who are deceived by Masjid As-Sunnah’s admin, we will do our best to refer them to the students of knowledge whenever they seek clarification, and may Allaah free them from the deceptions of the dishonest hizbiyyoon. Aameen. [الْحَمْدُ لِلَّهِ]—we neither established our stances based on the reckless methodology of the Hajaawirah nor the repugnant hizbiyyah of Ihyaa Turaath, Greenlane, Al-Maghrib Institute, Suhaib Hasan and their associates; rather we only followed the verdicts of the scholars of Ahlul Athar- founded upon the knowledge based proofs against Ma’ribi, Halabi, Maghraawi and their staunch follower Abu Usaamah. Therefore, neither should Naveed turn a blind eye to the facts nor expect us to follow his false assumptions and desires. Neither can the solution be based on the desires and false assumptions of those who are ignorant of the precise methodology of Ahlus Sunnah Wal-Jamaa’ah in dealing with the innovators and their staunch followers, nor can it be based on the solutions of those who attack the people of Salafiyyah and do not differentiate between the upright-knowledge based stances of Ahlus Sunnah Wal Jamaa’ah from the corrupt, deceitful and false stances of the Mu-mayyi-een. Note: We do not declare anyone an innovator or a Kaafir, except those whom our scholars have declared to kuffaar or innovators. This article is not a definitive compilation of all the statements of praise on Shaykh Rabee, but has been compiled in order to dispel the lies and deceptions of those who revile Shaykh Rabee bin Haadi Al Madkhalee. Some people say that Shaykh Rabee is not respected by the Scholars or that he is not held in high regard, or even that he has been warned against! Well to them we say; read this article, Fear Allah and rectify your tongues. The article is not comprised of my statements or statements of fulaan or fulaan, rather in this article are a handful of statements from the major scholars past (may Allah have mercy on them) and present (may Allah preserve them) concerning the status of the Shaykh – and we do not praise anyone over the praise of Allah. Verily Ahlul ilm know the status and rank of ahlul ilm. Questioner: A rumor has appeared and it is being carried by some people with sick hearts, claiming falsely that you have spoken ill of Sheikh Rabee in a lesson from one of your lessons. And we dont believe that they want by this except to set the Scholars in opposition against one another. So what is your statement concerning this? And what is your instruction to these people? Therefore we would like to take a tape and spread it to clarify their falsehood. “Sheikh Rabee is from those who are busy with knowledge during this time period, and he has efforts which are good and tremendous in working with the Sunnah. And also he has authored works, so he has authored works which are good and tremendous and beneficial.And I do not criticize him, nor do I warn from him, and I say he is from those Scholars whom are well grounded and if he is busy with knowledge you find in him many benefits. Therefore I consider Sheikh Rabee to be from the Scholars, those whom should be listened to, and from those Scholars whose benefit is great. What is your advice concerning the one who forbids the cassettes of Shaikh Rabee’ bin Haadee [from being distributed] with the claim that they cause fitnah and that they contain praise of the Wullaat ul-Umoor of the Kingdom, and that his praise of them emanates from nifaaq (hypocrisy)? We consider this to be a great error and mistake. Shaikh Rabee’ is from the Ulamaa of the Sunnah, and from the people of goodness. His aqidah is sound and his manhaj is strong and sound. However, when he began to speak about some of the symbolic figureheads of some of the people, from amongst the latecomers they began to tarnish him with these faults. Do you know [this] now? So I will mention when we went to the Noble Scholar Sheikh Abdullah Ghudayyan, may Allah preserve him. So we entered upon him in his office and we gave him the greetings, so he stood and shook Sheikh Rabees hand, gave us the greetings, and sat us down with him. So he began to speak with Sheikh Rabee with delight and gentle, polite humor. Then the talk was surrounding the minhaj, so Sheikh Rabee said, We warn from mistakes in the minhaj that oppose the book and the Sunnah and oppose the minhaj of the Salafi Salih that some of the callers fall into, so that the people will not be deceived by them. So Sheikh Ghudayyan said, I am with you in this oh Sheikh Rabee. And before Sheikh Rabee sought permission to leave, Sheikh Ghudayyan requested some of Sheikh Rabees recent books so he could look at them, so Sheikh Rabee promised to send this to him. “No doubt, this is oppression and a wrongful form of aggression. We do not know of any contradictions to the Sharee’ah by Shaykh Rabee’. And we do not of any of the well-known scholars to warn against (him). I read and I hear in some sittings a campaing slandering the noble scholar as-Shaikh Rabee’ ibn Hadee al-Madkhalee and warnings against him, in addition to taking from him (knowledge), and that he is not from Ahlus-Sunnah wal-Jamaa’ah, which made me become confused in my affair (of seeking knowledge). So what is the ruling upon this, please clarify? 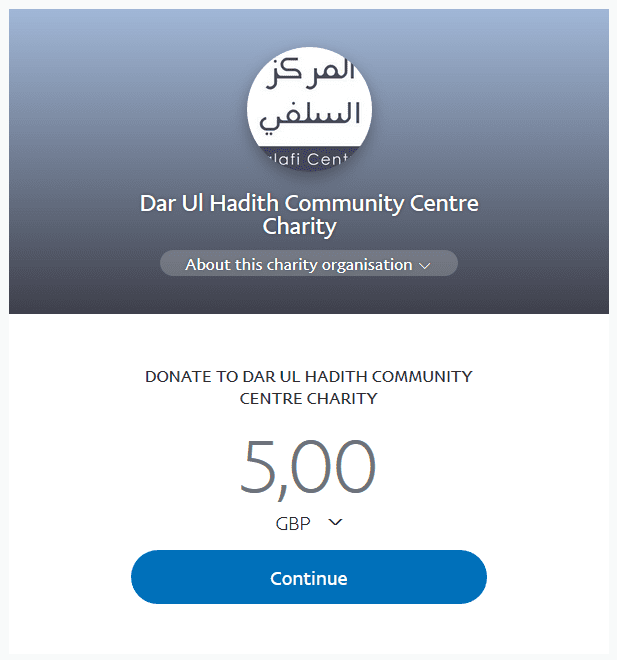 Jazakumullaahu Khair. There is no doubt that he (Shaikh Rabee’) is from the people of knowledge, and he is from the students of our Shaykh, Shaykh Abdul ‘Azeez (Ibn Baaz) (when they were) in Madinah, and he (Shaykh Rabee’) used to be from the teachers of Madinah (Islamic) University. I do not know any deviations of him neither in Aqeedah nor in Akhlaaq (mannerism), rather my perception of him that he is good and that he is from the people of goodness, as well as being from those who battle the callers to fitnah. Second matter: Ash-Shaykh Rabee’ bin Haadee Al Madkhalee is from the people of knowledge and what an excellent man! …..
…Rather, if they presented this matter to Shaykh Rabee’ it would become apparent to them, that he does not intend this dangerous path and dispelling methodology, rather the intent is those lenient ones, the warners and those who say: we facilitate all the people from all walks of life and each one of us acts upon what he believes and we excuse whatever others believe! No, the matter is not like that as well. It is obligatory that the truth be dominant upon various people and their ways and it is Allaah whose help we seek. How long have you known sheikh Rabee? …by Allaah I would not have believed it if all the people told me for my experience of knowing Rabee while even as a student and until now I have not known him ever to lie. Is Sheikh Rabee from the Kibaar al Ulamaa? Who is in this time similar to him? He knows the reality of most of the callers. Who is like him? He knows with proof and evidence. He doesn’t speak about anyone except with the proof. That is why I say about Rabee Haadee is similar to Yahyah ibn Ma’een in this time. You must forgive me son I have become old I forget, now I am 90 years. Shiekh Ibn Baz rahimahullaah is the Umar ibn AbdulAziz in this era. And sheikh Nasrud Deen al Albaani rahimahullaah is the Ibn Taymiyyah of this era. and Sheikh Uthaimeen rahimahullaah is the Shaf’ee of this era. By Allaah, the most knowledgeable of our scholars in this time ibn Uthaimeen rahimahullaah and the most generous is Sheikh AbdulAziz ibn Baz rahimahullaah, And the most knowledgeable of those differences between people and knowing the truth is Sheikh al Albaani rahimahullaah, and the most knowledgeable ones of Rijaal (men) with proof and evidence is Sheikh Rabee Haadee May Allaah protect him. And May Allaah protect his intellect. When sheikh al Albaani rahimahullaah showed the errors of Sayid Qutb and Abdullah Dawaish rahimahullaah no one moved but when Sheikh Rabee may Allaah be pleased with him, showed the misguidance of Sayid Qutb and he clarified it from his (Sayid Qutb’s) books and his situation in the past, the world was against Rabee. He said it with openness and evidence. So may Allaah reward him and make him firm and may Allaah keep him alive to remove those who wear the clothes of salafiyyah in order to fight it. We ask Allaah to show their state and clarify them and keep their evil away from us. Shaykh bin Baz leter to Shaykh Rabee asking him to refute an individual who made taweel of Allah’s attribute and to clarify the truth to the Muslims. Regarding the speech of the one-called Nazih Hammad on the Noble Qur’an Radio [program]. His respectfulness, the Noble Brother, the Esteemed Shaykh, Dr. Rabee’ bin Haadee al-Madkhali, may Allaah grant him safety, Ameen. After giving salutations, the Shaykh mentioned that he was informed by Dr. Muhammad bin Sa’ad ash-Shuway’ir of Shaykh Rabee’s hearing of the speech of the one called Nazih Hammad which was broadcast on the Noble Qur’an Radio [program] on 12/6/1415H between 7am and 8am and that he spoke about the Ta’weel of the attributes of al-hayaa and al-ghadab.